The UK's first quantum accelerometer for navigation has been demonstrated by a team from Imperial College London and M Squared. Most navigation today relies on a global navigation satellite system (GNSS), such as GPS, which sends and receives signals from satellites orbiting the Earth. The quantum accelerometer is a self-contained system that does not rely on any external signals. This is particularly important because satellite signals can become unavailable due to blockages such as tall buildings, or can be jammed, imitated or denied – preventing accurate navigation. One day of denial of the satellite service would cost the UK £1 billion. Now, for the first time, a UK team has demonstrated a transportable, standalone quantum accelerometer at the National Quantum Technologies Showcase, an event demonstrating the technological progress arising from the UK National Quantum Technologies Programme – a £270m UK Government investment over five years. The device, built by Imperial College London and M Squared, was funded through the Defence Science and Technology Laboratory's Future Sensing and Situational Awareness Programme, the Engineering and Physical Sciences Research Council, and Innovate UK. It represents the UK's first commercially viable quantum accelerometer, which could be used for navigation. Accelerometers measure how an object's velocity changes over time. With this, and the starting point of the object, the new position can be calculated. Accelerometers have existed for some time, and are present today in technologies like mobile phones and laptops. However, these devices cannot maintain their accuracy over longer periods without an external reference. The quantum accelerometer relies on the precision and accuracy possible by measuring properties of supercool atoms. At extremely low temperatures, the atoms behave in a 'quantum' way, acting like both matter and waves. Dr. Joseph Cotter, from the Centre for Cold Matter at Imperial, said: "When the atoms are ultra-cold we have to use quantum mechanics to describe how they move, and this allows us to make what we call an atom interferometer." As the atoms fall, their wave properties are affected by the acceleration of the vehicle. Using an 'optical ruler', the accelerometer is able to measure these minute changes very accurately. To make the atoms cold enough, and to probe their properties as they respond to acceleration, very powerful lasers that can be precisely controlled are needed. 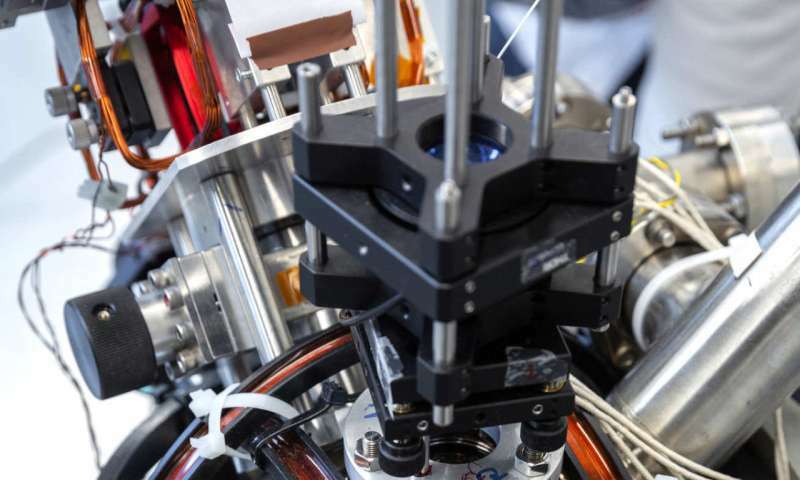 Dr. Joseph Thom, Quantum Technology Scientist at M Squared, said: "As part of our work in commercialising cold atom quantum sensors, we developed a universal laser system for cold atom-based sensors that we have already implemented in our quantum gravimeter. This laser is now also used in the quantum accelerometer we have built in collaboration with Imperial. Combining high power, exceptionally low noise and frequency tunability, the laser system cools the atoms and provides the optical ruler for the acceleration measurements." The current system is designed for navigation of large vehicles, such as ships and even trains. However, the principle can also be used for fundamental science research, such as in the search for dark energy and gravitational waves, which the Imperial team are also working on. Professor Ed Hinds, from the Centre for Cold Matter at Imperial, said: "I think it's tremendously exciting that this quantum technology is now moving out of the basic science lab and being applied to problems in the wider world, all from the fantastic sensitivity and reliability that you can only get from these quantum systems." Dr. Graeme Malcolm, founder and CEO of M Squared, said: "This commercially viable quantum device, the accelerometer, will put the UK at the heart of the coming quantum age. The collaborative efforts to realise the potential of quantum navigation illustrate Britain's unique strength in bringing together industry and academia – building on advancements at the frontier of science, out of the laboratory to create real-world applications for the betterment of society."